Scotland's golf enthusiasts are being advised to move quickly if they want to snap up an award winning property next to a planned 60 million golf and leisure resort. Kingennie Fields in Broughty Ferry, one of Scotland's most prestigious residential developments, is located close to "The Angus", a new world class golf resort to be built by MAP International which will include a Wyndham Grand Hotel. The five star golf and leisure destination, due to open in 2015, will boast a luxurious hotel with spa set in an elevated position overlooking a signature 18-hole championship golf course, designed directly with 2011 Open Champion Darren Clarke. As a result of the resort plans, Kingennie Fields agent CKD Galbraith has seen a substantial increase in the number of enquiries for properties in the close vicinity to the course. Seven houses at Kingennie Fields have already be sold, with one serviced plot currently under offer and four plots remain on the market but CKD Galbraith forecast the heightened interest in the area will lead to further sales soon. 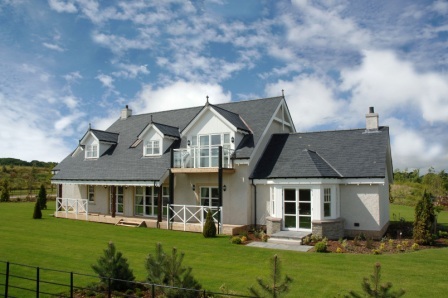 The existing houses built on generously sized plots, have been beneficiary of many industry awards, including Best Luxury Home by the Scottish Home Awards. The houses are designed with modern lifestyles in mind and are the cutting edge of energy-efficient and environmentally friendly housing. Inspired by a New England style and finished with traditional Scottish materials, the four to five bedroom homes offer are stunning on the outside as they are clever on the inside. Flowing, generously proportioned living spaces and the grandeur of full height, feature ceilings combine with all the state of the art practical requirements of a modern family home. From the built in security systems and remote-controlled garage doors to the dedicated laundry and boot rooms every aspect of the home contributes to stress-free, convenient living. The incorporate ground source heat pumps, which harness latent solar energy contained in the earth, provide a truly sustainable and extremely cost effective heating solution, which can reduce heating bills by up to 50 per cent. The homes benefit from Leicht German kitchens which include a dedicated wine cooler, built in coffee-maker and microwave and Gaggenau appliances whilst the Porcelanosa-designed bathrooms include features such as a Jacuzzi bath and double washbasins in the master suites. 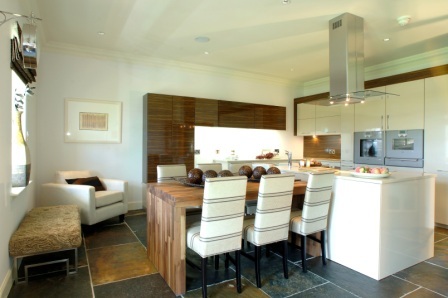 Views of the Tay estuary and rugged coastline can be enjoyed from many of the homes and are matched on either side by idyllic rolling countryside. The area offers an abundance of outdoor, recreational and cultural activities for all ages and education is well catered for with independent schools, colleges and universities in Dundee as well as St Andrews University only 18 miles away. 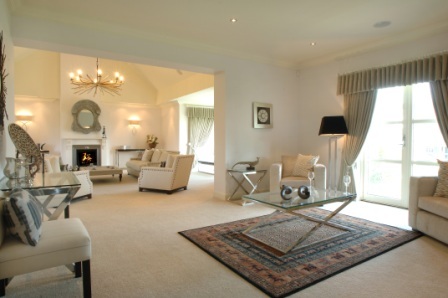 Golf courses, putting greens and fishing lochs are on the doorstep at the Forbes of Kingennie resort and excellent schooling, restaurants and shops are less than ten minutes away in Dundee. Harry Stott, who is handling the sales for CKD Galbraith, said "The plots on offer at Kingennie Fields present a wonderful opportunity to own a stunning, contemporary house in an enviable rural setting taking advantage of the spectacular countryside. In addition, purchasers will be able to put their own stamp on their property. "The development will be complemented by the significant investment to be made nearby at The Angus and we expect this the be attractive draw to purchasers"
The serviced plots at the exclusive Kingennie Fields development range from 195,000 to 225,000. Find out more about the plots available.